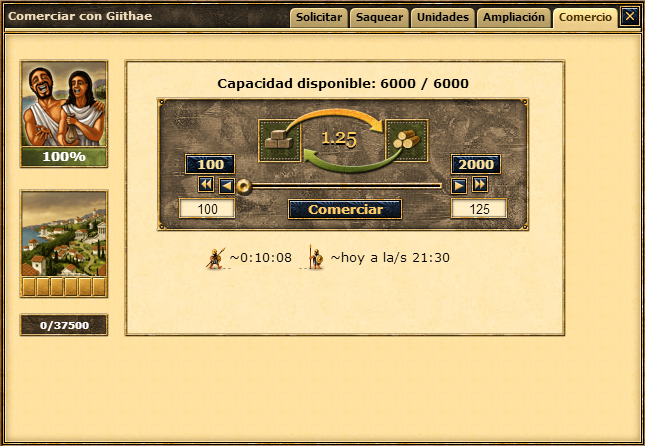 The Mercado enables you to trade your 3 resources, Stone, Wood and Silver. As each island is naturally plentiful of one resource and lacking in another, trading becomes important to obtain all resources necessary for your city's growth. In order to balance the uneven production of the three raw materials, it is important to trade excess resources with farming villages. In order to trade your city must have a Mercado. For this, you must have a level 3 Senado and a level 5 Almacén. The farming village you wish to trade with must have a mood of at least 80%, so it is advisable to trade with a farming village before you loot the village. Once you have found a farming village that is prepared to trade with you, click on it and then click on the to open the Trade window. Once open you see a window like the one bellow. You can see that this particular village is willing to trade Wood ( ) for Silver ( ). In the center you see the ratio at which they want to trade, in this case it is 1.25. For every 100 madera you send, you get 125 plata back. Farming villages only hold 2000 resources for trade at any given time, regardless of the level of your Mercado. Note: The minimum recources that can be traded are 100. To start trading with the village, use the slider to select how many resources you wish to send and click 'Trade'. You can see here how many resources you will receive in return as well as the time taken for the resources to arrive at your city. (note that your resources leave your city instantly). When the farming village's merchants arrive you receive a report detailing the trade. However, you have the choice either to stop receiving the trade reports, or to turn off the notification feature. You can simply do that by selecting the Reports option -> Filter. Trading with farming villages influence neither the mood nor the strength. After the trade, the trade ratio falls by 0.03 points per 100 delivered resources. Irrespective of the mood or strength of the farming village, the trade ratio will rise by 0.02 points per hour until it reaches 1.25 once more. Esta página fue modificada por última vez el 18 dic 2017 a las 20:48.